Businesses today live and die by their apps. Sound dramatic? Think again. For starters, reliance on business and productivity apps has become second nature for new entrepreneurs and seasoned industry vets alike. Business owners’ can’t live without their smartphones, especially since they serve as their own extension of our in-person offices. Meanwhile, consider how more and more businesses are getting on board with building their own apps. With the help of services such as Buildfire, companies both big and small can get on board with the app revolution without too much existing tech knowledge. The takeaway here is that apps are totally ubiquitous for today’s business owners. That said, which ones reign supreme? Which iPhone staples represent the must-haves when it comes to business efficiency? Below is a list of eight essential iOS apps that can help just about any business get more done and, at the end of the day, zero in on a bigger bottom line. Working in tandem, this combination of apps serve just about any business owner in any industry. 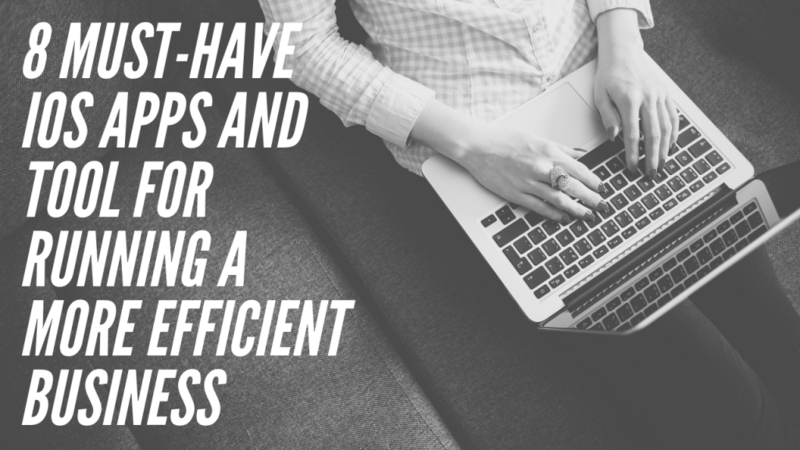 Given that lack of productivity plagues many business owners, anything you can do to organize the chaos in your life as a business owner is a major plus. Wunderlist helps you do just that, serving as much more than your typical to-do list. With features including reminders, notifications and note-taking, the app is a prime place to dump all the idea spinning in your head and turn them into something manageable. Wunderlist’s sleek design and ability to sync across multiple devices is also a nice added bonus. Project management apps are all the rage right now for good reason. The ability to see what your day-to-day or even month-to-month projects ultimately keep you from guessing what your top priorities should be. That’s where Trello comes in. While there’s some debate over the best project management tool, Trello shines over the likes of Asana thanks for its simple design and forever-free platform. Business owners can collaborate with colleagues and keep each other in the loop with Trello’s drag-and-drop card system so you always know progress of your next project. No matter how much technology evolves, we simply can’t escape the old-school need for real-time signatures and sending documents back-and-forth. For the sake of saving time and keeping better record-keeping, DocuSign allows you to digitally sign-off of documents such as legal forms or invoices at a moment’s notice minus the massive paper trail. Invoicing can be a notorious time-sink for business owners, especially busy ones serving a ton of clients and customers. Features in Freshbooks such as invoice templates and automated billing ultimately put the payment process on autopilot, ensuring that you get paid on time without having to chase clients around. In short, a major win-win. Another game-changer in terms of productivity, RescueTime can truly open your eyes to which tasks are eating up the most of your schedule. In short, the app helps you log your daily must-do’s (think: writing emails, sitting in meetings, conducting research) and alerts you to how much time you’re spending to help you wrangle your schedule. If you have trouble sticking to a strict timetable, RescueTime can help. Chances are you already use G-Suite of apps in some way, shape or form, right? That said, many people overlook the sheer power of Google Drive beyond mere file-sharing and collaboration. For example, consider some ways you can get more out of Google Drive through features such as document signing and team permissions which can help the platform act as a sort of central hub your business’ files. Those running email campaigns should seriously consider using MailChimp not only because they’re an industry leader, but all because of just how robust its mobile app is. Notifications, status reports and suggested next steps all keep you in the loop about your campaigns’ performance, meanwhile also helping you fine-tune them over time. Saving time with scheduling is a must-do for businesses who want to see a positive ROI for their efforts. Buffer’s free app allows for straightforward social scheduling when you’re away from your desktop, including scheduling on the likes of Facebook, Twitter and Instagram. Given that the bulk of all social activity happens via mobile, the ability to schedule from an app just plain makes sense. If nothing else, you can better track the performance of your social campaigns on-the-go. There is no single, “silver bullet” solution to streamlining your business – it’s all about having the right stack of apps to make it happen. From tedious tasks to your ability to collaborate and put some of your marketing on autopilot, any combination of these iOS apps is fair game for budding business owners. Cartoon HD | Download Movies and TV Shows Free!